First Frost Friday Morning? 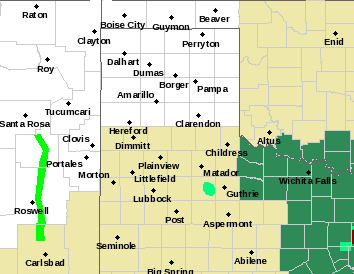 - 2015-2016 NM Winter Outlook. November is starting out warmer than normal but this will change later this week. 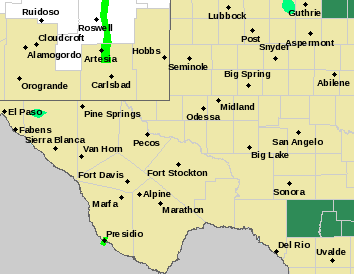 Two cold fronts and an approaching storm will impact the state tonight into Saturday. Snow will spread over the higher mountains of western and northern New Mexico tonight into Thursday. 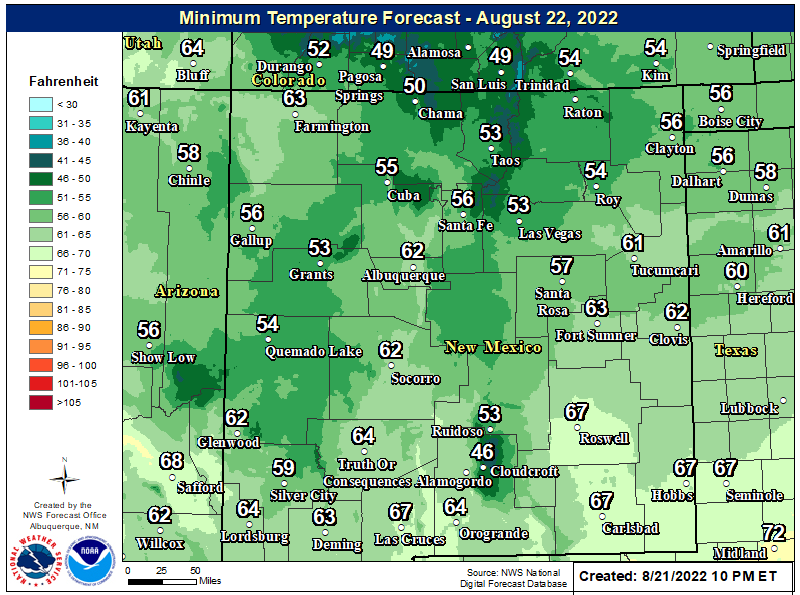 Will southeastern New Mexico see its first frost Friday morning? Winter Weather Impacts As Of 10:30 AM MST This Morning. 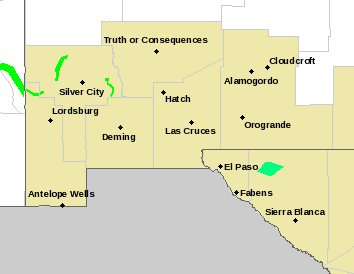 Special Weather Statement From NWS Albuquerque. 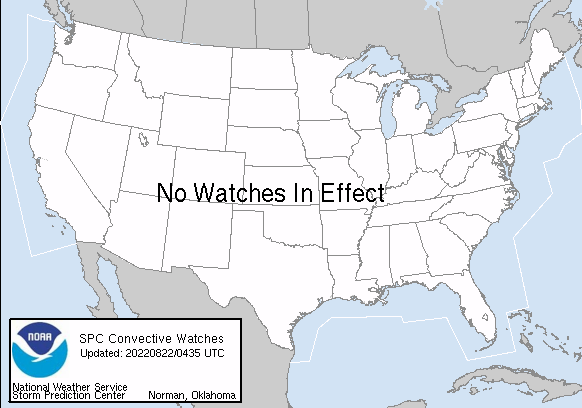 Click On This Link For The Latest NWS Watches/Warnings/Special Weather Statements. 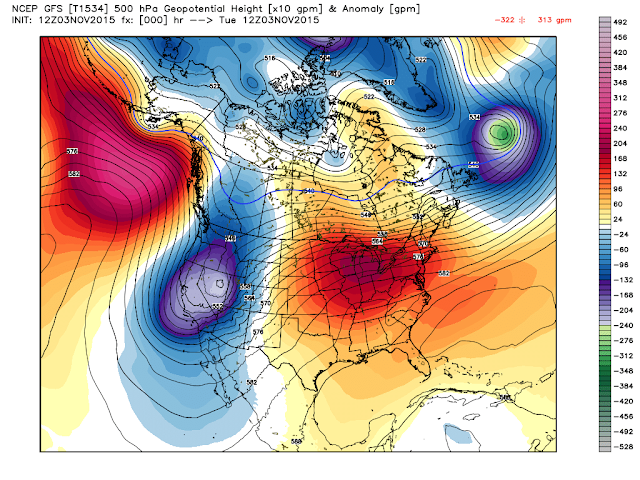 Strong Mid Level Storm Will Bring Changes This Week. GFS 500 MB Analysis @ 5 AM MST This Morning. GFS 500 MB Temps @ 5 AM MST This Morning. Have you ever wondered why I am always posting the 500 millibar maps on my blogs? If so here is the answer. Generally speaking the 500 millibar/18,000' level is roughly mid way up in the earths atmosphere. Going up from sea level/or the surface up to about 40,000'. 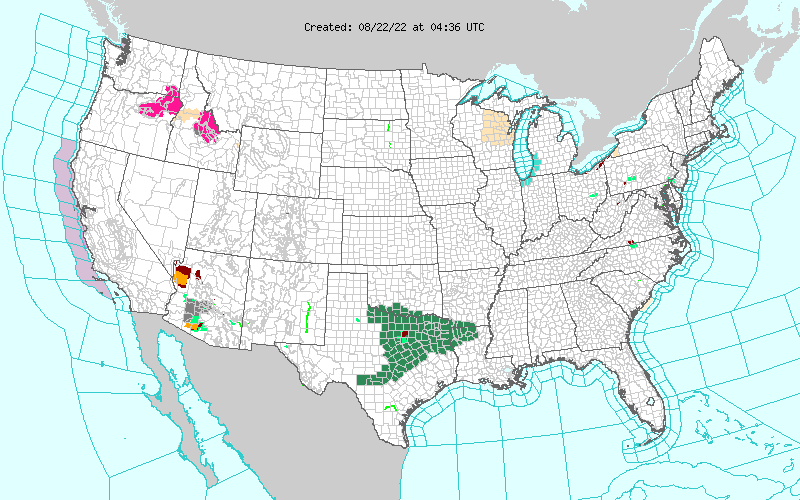 At this level/altitude you get a fairly clear picture of whats going on storm-wise. You are above the friction from the surface including mountain ranges, but you are also below the jet stream...in most cases. So the lower the pressure of a storm at this level/altitude is, then the stronger it will be. We look at the heights or central pressure of the storm to determine this. 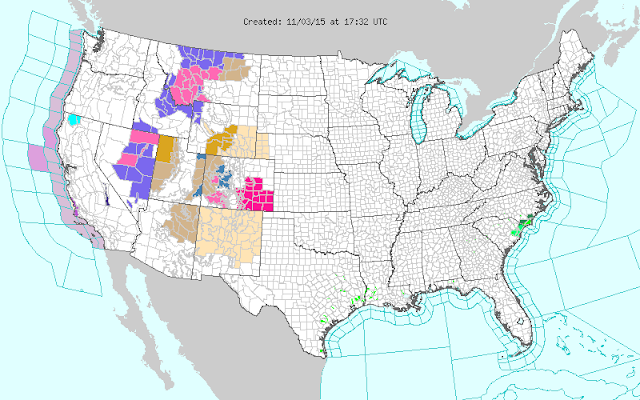 And this mornings map showed a fairly deep storm centered over Nevada. Another way to determine how strong a mid or upper level storm will be is by looking at its temperature profile (second map above). 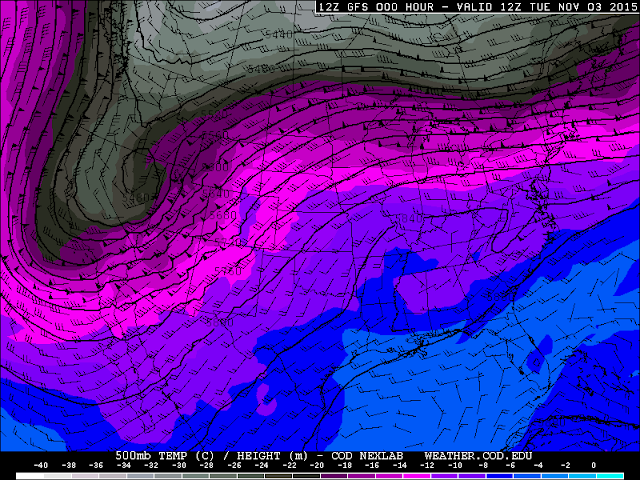 The colder the core of the storm is then generally the stronger it will be. Looking at our storm this morning we see that it had temperatures of about -25°C/-13°F. The temperatures in these storms in the winter time can drop down to -40°F. More information can be found via this link. GFS Forecast Temp Anomalies @ 5 PM MST Today. 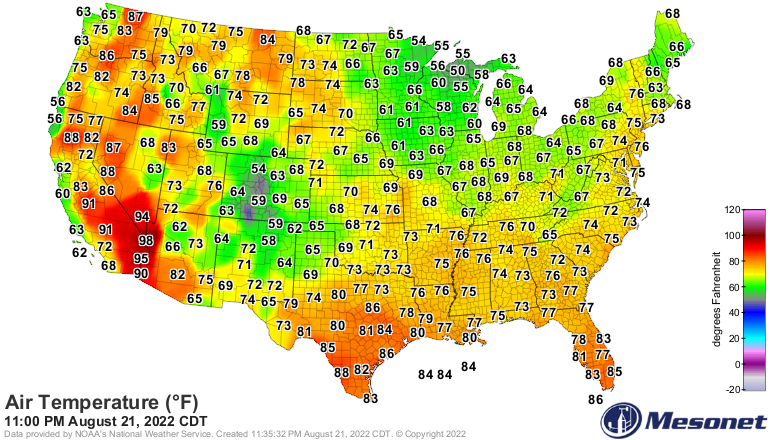 Meanwhile temps in the upper 70's to the lower 80's are forecast across the eastern and southeastern plains today. These temps will be running some 5 to 10 degrees above normal. Although warm for this time of the year I think that most of us will not see recording breaking readings this afternoon...a few locations may get close. 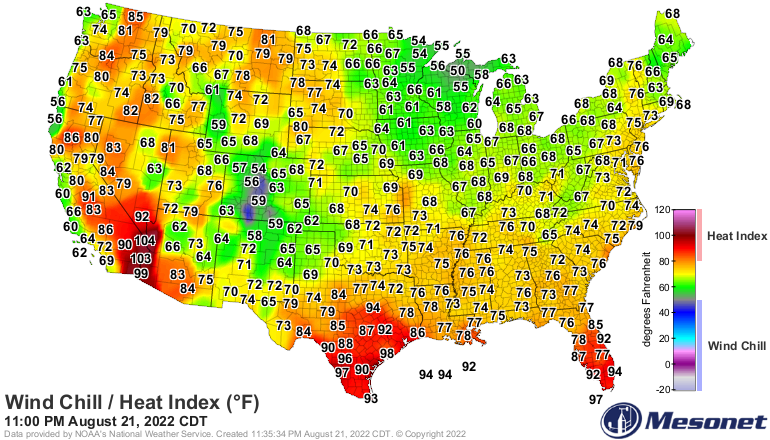 A few stations in New Mexico tied or broke their records yesterday. Record High Temps For November 3rd. Pine Springs 75 in 2005. Turning Colder Wednesday Into Friday. 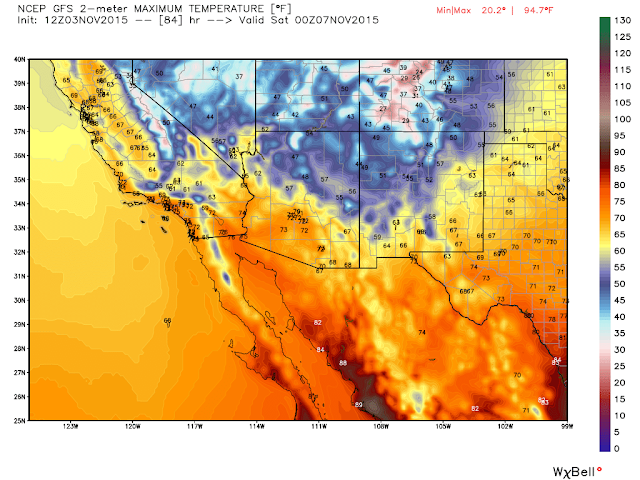 GFS Forecast High Temps Friday @ 5 PM MST. 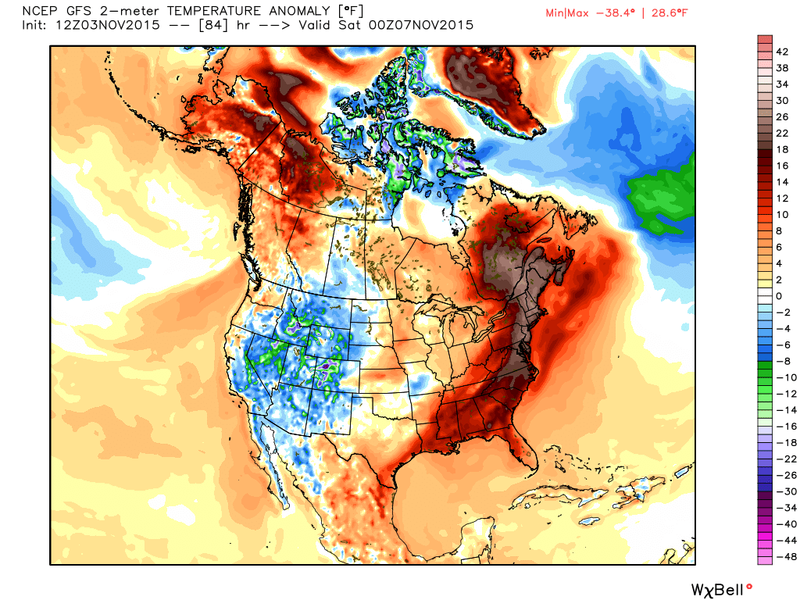 GFS Forecast Temperature Anomalies On Friday @ 5 PM MST. As the mid-upper level storm to our west opens up and sweeps across the state Wednesday into Thursday it will drag a cold front eastward with it. 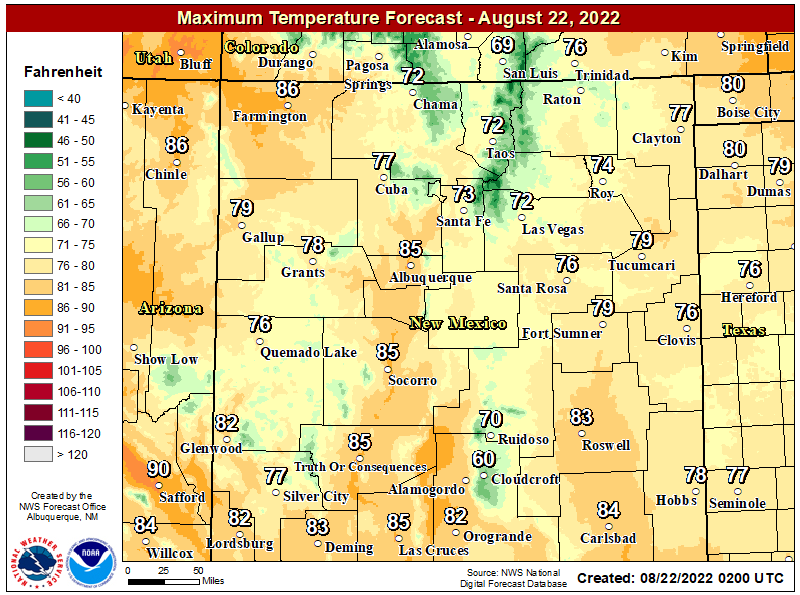 Most of southeastern New Mexico will see highs ahead of the cold front on Wednesday in the mid-upper 70's. 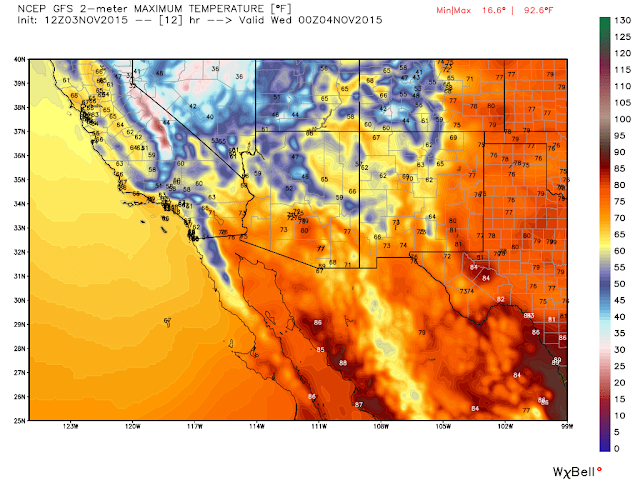 Temps will drop into the mid-upper 60's behind the front on Thursday, and the low-mid 60's on Friday. Some of us will see our first frost/freeze of the season Thursday night into early Friday morning. Forecast low temps for the lower elevations of southeastern New Mexico will range from the low-upper 30's. 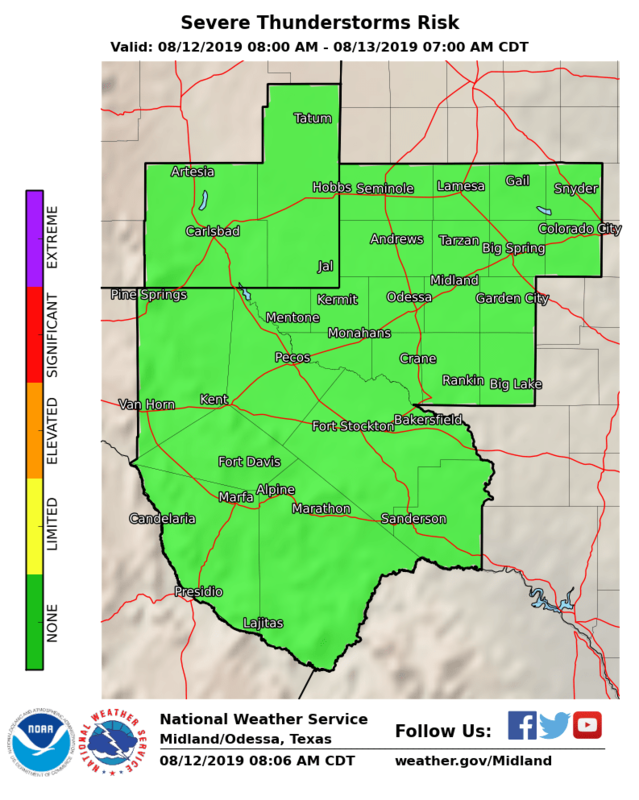 Locations most likely to see a freeze/frost will be the normally colder spots such as open farmland, fields, and lower elevations near the Pecos river. It doesn't appear at this time anyway that a widespread killing freeze will occur (temps lower than 28°F for several hours). Of course the higher mountain valley locations (above 5,000') will see colder temps with readings in the 20's Friday morning. We are running a little late this year concerning our first freeze here in SE NM. 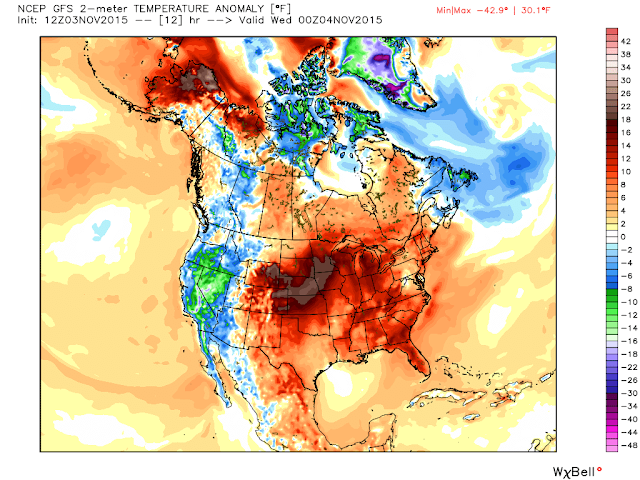 Our first freeze normally occurs around Halloween. Some places about a week before and some about a week after. Snow In The Higher Mtn's Of Western & Northern NM. GFS Accumulated Snowfall Forecast Valid @ 5 PM MST Thursday. 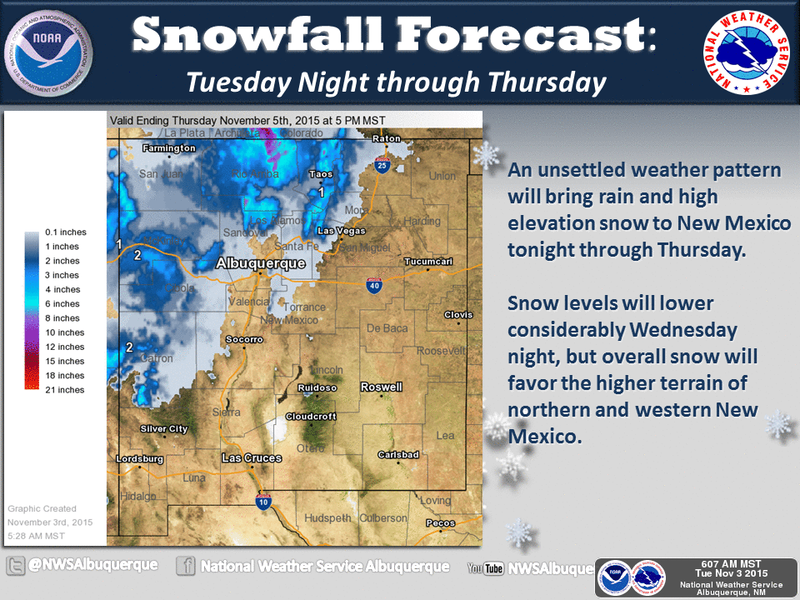 Snow is forecast to fall in the higher mountains of western and northern New Mexico tonight into Thursday. 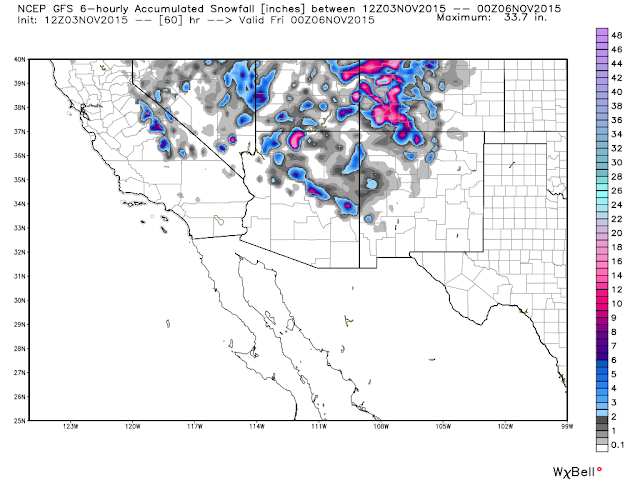 A few spots near the Colorado state line may see some hefty totals. Ski Apache in the Sacramento Mtn's may see around an inch or so. 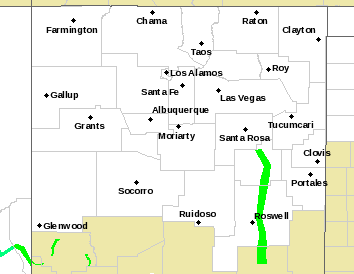 Light snow appears possible in Ruidoso and Cloudcroft too. What's In Store For This El Nino Winter? 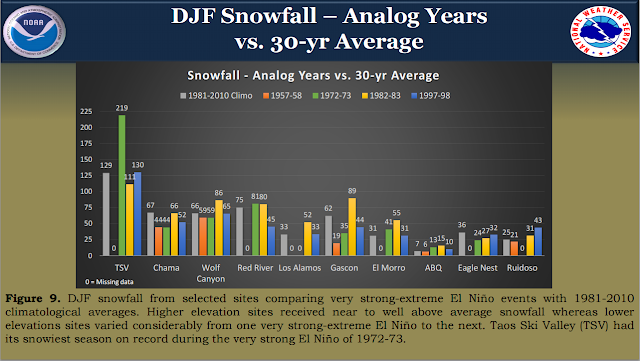 Looking at historical past El Nino events that have affected New Mexico since 1950, and comparing them with currents conditions in the Pacific Ocean, then we can tell that this winter holds the promise of being a rather stormy one for the state. Take a look at the latest outlook for this winter via this link courtesy of the Albuquerque National Weather Service Office. Most El Nino winters are typically colder and wetter than normal here in southeastern New Mexico. More on this at a later date.